Aug. 25 -- Portland Thorns defender Rachel Van Hollebeke is calling it a career. The 30-year old is retiring from the Thorns and from United States soccer to pursue her dream of becoming a doctor. She was a three-year team captain of the soccer team at Stanford while completing her undergraduate studies. She was accepted into medical school at the University of California at San Diego. Van Hollebeke has been with the Thorns of the National Women's Soccer League all three seasons of play. Over my soccer career, I’ve developed a special pre-game routine. My favorite part is when I look at a little photo album filled with pictures that bring me joy. Some pictures are of my family, my friends, and my wedding day. Some are of me playing soccer for the U.S. National Team and for my club. But my favorite photo is one of me playing soccer as a kid. I am competing for a ball against a girl twice my size. I am a much scrawnier and younger version of myself, but I have the same look of determination that I see in pictures today. All told, I really haven’t changed much. I thrive on the freedom I feel when making tackles and using my instinct on the field. That special feeling is why I have continued to play for almost 25 years. I still love the game and I always will, but the time has come where I am ready for other things. At the end of this 2015 NWSL season, I will be retiring. For me, the decision to retire has been a slow process involving many different factors. But primarily, it was driven by my desire to follow another one of my childhood dreams: to go to medical school and become a doctor. I start medical school at UC San Diego at the end of August. Unfortunately, there is overlap between the end of the NWSL season and the beginning of school. Depending on the team’s need and my medical school schedule, I will do my best to remain available to the Thorns through the duration of the season. I love this team and this city, and I want to continue to contribute however I can. Besides pursuing soccer as a kid, I always wanted to be a doctor. My father was a cardio thoracic surgeon, and my idol growing up. Not many kids grow up watching heart surgery videos, but I vividly remember sitting on the living room floor with my dad, mesmerized by the magical, beating mass on the TV screen. Influences from my father and my experiences with two torn ACLs in high school helped solidify my interest in medicine. I was pre-med at Stanford and when I graduated in 2007 I thought medical school was going to be my next step. Then, in 2008, things changed. The new U.S. coach, Pia Sundhage, called me into camp. I made it onto the 2008 Olympic team, and after that soccer really took off for me, with appearances in the 2008 and 2012 Olympics, and the 2011 Women’s World Cup. Still, medicine remained a passion, and I decided to apply to medical school in 2011. I have been deferring my acceptance to the UCSD School of Medicine to pursue soccer, but now I am ready and excited to start this next phase of my life. I have had so many incredible experiences during my soccer career. I’ve developed friendships that I will cherish forever and I’ve gained skills, like work ethic, perseverance, teamwork, mindfulness, and performance under pressure that will serve me my entire life. It is difficult to express what a privilege it has been to play for both club and country. If you’ve ever watched me during the National Anthem, I take it very seriously and sing with all my heart. Wearing the Red, White and Blue for over 100 games is the greatest honor of my life and playing in two Olympics has been the highlight of my career. I will never forget the feeling of standing on the podium, gold medal hanging around my neck. I remember thinking about the countless hours of practice, the challenges and successes, and the people who helped me get to that point. I was so thankful and proud. I have been fortunate to play in two professional leagues in the U.S. and I am proud that I helped pave the way for professional women’s soccer in America. In the WPS, I had wonderful experiences playing for the 2010 champions FC Gold Pride as well as the Boston Breakers. 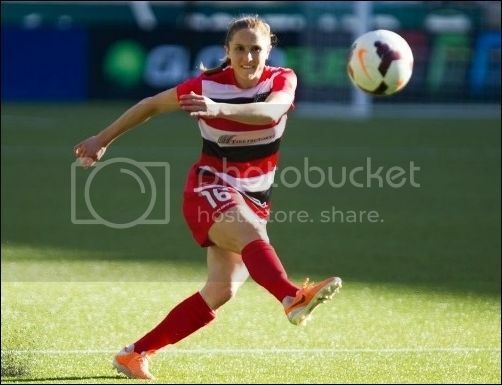 Now, in the NWSL, I am blessed to play for Portland Thorns FC. The organization has set the standard for professionalism in the league and our fans are the best in the world. My first home game I was blown away by the Rose City Riveters and their coordinated chants, creative banners, and passion for our team. Since then, the support has only grown and we keep breaking attendance records. I am so proud to be a founding member of the Thorns, helping bring home the championship in 2013 and playing here the past three seasons. There are countless people who have helped and supported me throughout my soccer career. I cannot say thank you enough! To my family and husband, Bobby, thank you for your endless love and support. You’ve been by my side every step of the way and I would not have been able to do this without you. To the medical team, administrators, and staff who work tirelessly behind the scenes, thank you for taking such good care of us and making it possible for us to pursue our passion on the field. To U.S. Soccer, you invested in me from an early age and bestowed upon me the greatest honor - representing the USA. Thank you. And to the amazing fans in the U.S. and abroad, thank you for always believing in our nation and fueling the growth of soccer in America. To my youth coaches at San Diego Surf, Torrey Pines High School, and Cal-South, my college coaches at Stanford, and all those I worked with as a professional and through the youth and full National Team programs, each one of you taught me something different and inspired me to be my best. Thank you for helping me grow as a player and a person. To my teammates, you are my sisters and I love you all so much. We’ve seen each other through many ups and downs and shared experiences of a lifetime. I am honored to be part of such an outstanding group of women. To the Thorns organization, thank you for investing in the women’s game and providing us with the opportunity to play in this amazing environment. And to all the Portland fans, especially the Rose City Riveters, your passion and undying commitment to me, the team, and the sport is a special gift. It has been an honor to play in front of you and I will miss it dearly. Soccer has been a huge part of my life for the last 25 years. It has brought many joys and occasional set-backs, but most of all it has been an incredible teacher and has helped shape the person I am today. I am so thankful for my soccer experiences and while I’m sad to move on, I am very excited to pursue my other long-held dream of becoming a doctor.